I’ve received a lot of requests for crispy oven baked fries lately. I guess some of yall are trying to give up those addictive, mystery fast food crack fries. I’m right there with ya because I absolutely LOVE Bojangles fries! Something about dipping those salty, spicy seasoned fries into cold ketchup is close to heaven to me. 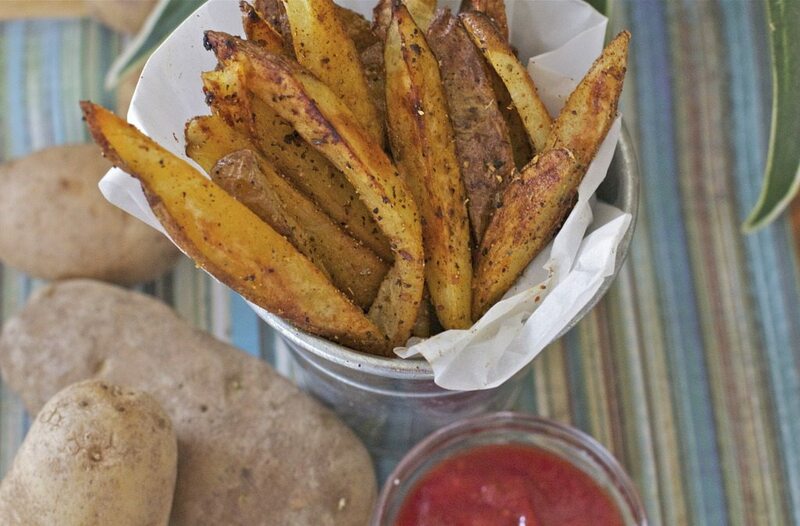 You’ll love this recipe for oven baked fries. Everyone that tastes them loves them no matter if they are seasoned with cajun spices or just sprinkle with salt. They bake up crisp on the outside and hot and tender on the inside. And boy oh boy are they spicy and well seasoned, just the way I like’em!! (I make a few unseasoned on the side for Isaac) Give me a side of chili sauce or ketchup and I’m a happy girl. I don’t miss the taste of fast food fries at all. So when the craving for the Golden Arches come knocking on the gates of your soul just head into the kitchen and whip these babies right on up. They’re healthier and taste much better than anything you can get from fast food joints. Super big props to Cooks Illustrated for such an amazing baked fries technique!!! Letting them soak in water and covering with foil in the beginning really helped crisp them up. Homemade natural cut fries, seasoned with a cajun spice blend and baked to a crisp perfection in the oven. 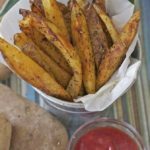 They are so good and healthier than fast food fries! Cover with hot water and let sit for 20 minutes. Prepare the cajun blend by combining all spices in a bowl, set aside. Drain potatoes and dry them off thoroughly. Brush a baking pan with 3 tablespoons of oil and sprinkle pan with ⅓ of the cajun seasoning. Toss the potatoes with 1 tablespoon of oil and sprinkle lightly with seasoning. Place the potatoes on the pan in a single layer. Cover with foil and bake 5 minutes. Remove foil and continue baking for another 15-20 minutes until golden brown on the bottom. Flip potatoes and continue baking until crisp and golden, about 10-15 minutes. Keep an eye on them. Remove from oven and sprinkle with the rest of the cajun seasoning. Thanks for the recipe! I make fries all the time but always cut them into wedges and my seasoning blend was different. I tried your method and now these are mine and my husbands favorite way. Shade were so good! A little spicy for my preference, but the flavor is amazing. Like the notes say, I plan to try different herbs. I am definitely adding these to the rotation! This looks SOOOOOOOOOOOOOOOOOOOOOOOOOOOOO GOOOODDD !!!! MMHH !! Trying this on the weekend !